England's first, and one of Europe's greatest, centres of learning. Oxford's beautiful stone buildings, grand Gothic towers and wide open streets, give the bustling city an instant air of antiquity. No fewer than 653 of its buildings have been listed as historic or of architectural merit. Henry II paved the way for the first colleges in 1167, when he discovered that the exiled Archbishop Thomas Becket had found refuge in France, and so immediately ordered all English students on the continent to return home. Many then travelled to Oxford to try to re-create the style of learning they had discovered in Europe. Unrest between students and the towns folk caused the university to close in 1209. 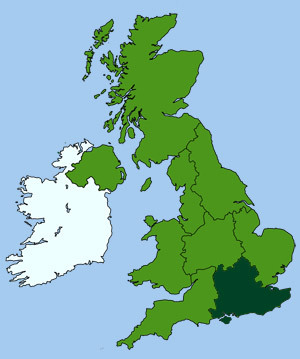 Its members either returned to the Continent, went to Reading, or moved to a small Fenland town called Cambridge, to found a new University there. University College was founded in 1249 when William of Durham donated money to support ten masters of arts. Balliol was established in 1263 after John de Baliol had insulted the Bishop of Durham by calling him names and agreed to finance students at Oxford as a penance. The following year the Lord High Chancellor of England, Waiter de Merton, founded Merton, the very first residential college. Merton has one of the oldest libraries in England, built between 1371 and 1379. The original 13th century stained-glass windows can still be seen in the college chapel. 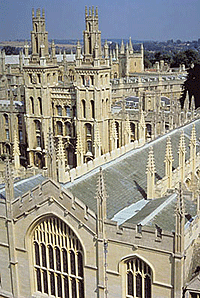 Merton was also the first college to give Oxford one of its key characteristics, the quadrangle. William of Wykeham. Bishop of Winchester, further developed the concept of the quadrangle when he founded New College in 1380. Much of the original building survives, a splendid example of English Perpendicular architecture. Lincoln, the college where John Wesley taught from 1729 to 1735, was founded in 1427. All Souls was founded in 1438, as a memorial to Henry V and the heroes of Agincourt. Its fine medieval hall still stands today. Magdalen (pronounced Maudlin) was established in 1458 by William of Waynflete, Bishop of Winchester. Its magnificent Gothic bell-tower, completed in 1509, stands like a sentinel beside the Magdalen Bridge. Christ Church (or Cardinal's College), one of the most beautiful in Oxford, was built in 1525 by Cardinal Wolsey. The great hall, with its elaborate hammer-beam roof, is truly magnificent. Wolsey's gateway leads through the bottom of Tom Tower (designed by Sir Christopher Wren) into Tom Quad, the largest of the city's quadrangles. Each evening, at five past nine, Great Tom the bell in the tower, tolls its curfew. The college chapel, 'Christ Church Cathedral', is the only one in the world to be designated a cathedral. There are now around 40 colleges, some very ancient and other surprisingly modern. 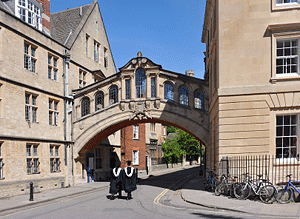 You can visit some of the colleges at certain times, however, Oxford has many more interesting places for visitors to explore, including several excellent museums and galleries such as the Ashmolean, which is the oldest museum in Britain. The Radcliffe Camera, located in the historic heart of the city, is one of England's earliest examples of a circular reading room. The nearby St Mary's Church is not only a beautiful building but a place for quiet prayer and meditation. A climb of its impressive tower will reward you with some of the finest uninterrupted views across Oxford's picturesque skyline and its surrounding countryside. In 1555, St Mary's Church saw three Protestant martyrs: Thomas Cranmer (Archbishop of Canterbury) Nicholas Ridley (Bishop of London) and the Protestant preacher Hugh Latimer condemned to death for heresy; the most notable victims of the 283 martyrs of Queen Mary's short and bloody reign. They were later burned at the stake in Broad Street opposite Balliol College. The Thames at Oxford is known as the Isis, based on its Latin name Thamesis. Each May the colleges row against each other during Eights Week. The river becomes like a Venetian carnival and crews try to bump the boat in front of them. The leading crew at the end of four days wins the title 'Head of the River'. At other times, punting remains a popular pastime for both students and visitors on the river. Punts can be hired from Folly Bridge, Cherwell Boat House or from the Magdalen Bridge Boat House, which also provides a chauffeured punting service. Another important event occurred at Oxford's Iffley Road sports track on May 6, 1954, when a young medical student, Roger Bannister, became the first man to run a mile in under four minutes.